WordToTFS v6.3 is now available. This is a minor update with small improvements and a new WordToTFS template. There are still some steps to go for being well prepared for Azure DevOps Server 2019, but this depends on the availability of some libraries that will be finally released with Visual Studio 2019 by Microsoft. At this point in time, we will release 7.0. But there are some improvements that should not wait any longer. The outcome of this configuration is shown in Figure 2. The update 6.3 of WordToTFS now supports using the formerly mentioned format specifier. Figure 3 shows a sample configuration while Figure 4 presents the result. In addition to this functionality we modified the installer. In the former version we detected an issue that the installer downloaded unneeded packages, even heavy ones like .NET Framework 3.5.1. This was due to an issue in dependency management. With version 6.3 this has been fixed. Dan Hellem (Microsoft) recently announced a new Basic process on Azure DevOps for very lightweight approaches. His blog post unveils more information on this topic. We created a new WordToTFS template support also this process. 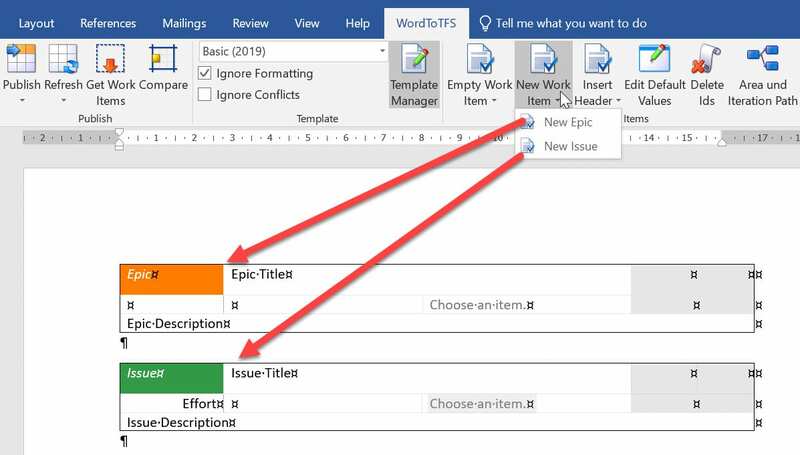 This WordToTFS template basically only provides mappings for the work item types “Epic” and “Issue”, as shown in Figure 5. According to current planning this is the last update of major version 6 of WordToTFS. As soon as Visual Studio 2019 is released, we change the underlying dependencies and fully integrate Azure DevOps Server 2019 in our test environment. If you have not installed WordToTFS already, download the software for free here. Otherwise you can simply click the Update button in the WordToTFS ribbon or wait some days until the automatic update mechanism installs it automatically.